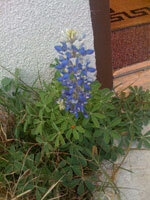 This was our first bluebonnet of the year. It popped up a couple of weeks ago beside the back door. I managed to resist taking its picture until the ladybug showed up. Awwww . . . ladybug. After last week's rains, we are hoping for a lot more bluebonnets soon, and other things as well. So you can expect some more wildflower pictures in your Illuminator.